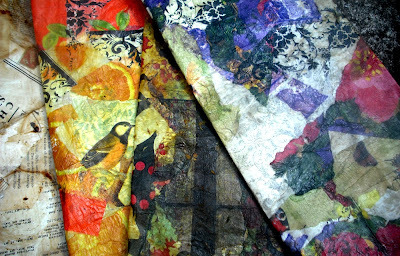 Recently a wonderful Art and Soul student, Pearl Winne, sent me a box of decorative napkins. I had been admiring hers when she took my classes at Las Vegas last month. She said she had too many of them and would send some. I was amazed to get a good sized box of tons o' napkins! They are soooo gorgeous. I decided to try an experiment whereby I'd decorate mulberry paper with fragments of the napkins and some other stuff. I was so happy with how they turned out. These are absolutely gorgeous! I love them. Thanks! Guess I never showed you this batch.